Summer travel plans are underway. Hats for Sailors are the perfect knitting to take along! 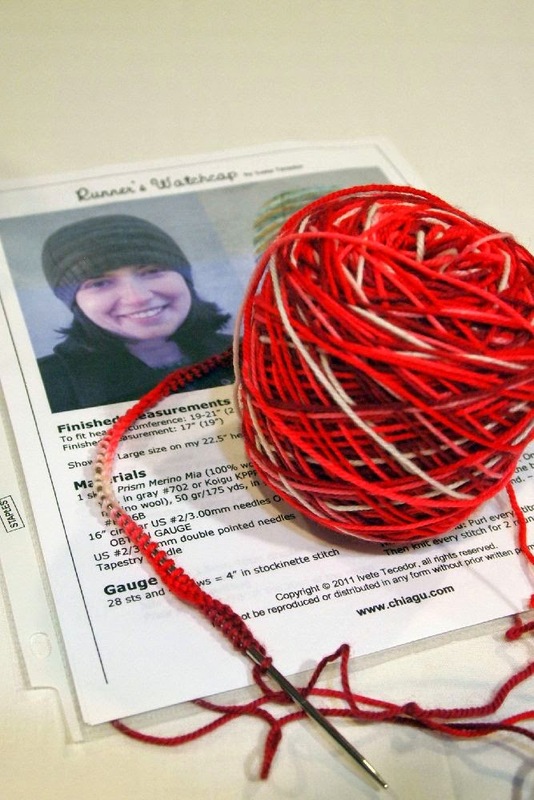 I don't know about you, but the only part of knitting hats I really need to pay attention to is the cast-on. After that, it's mostly mindless. 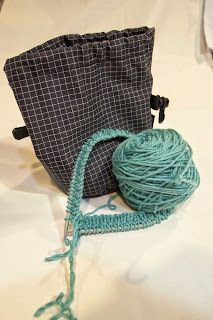 So I cast on multiple hats and put each in a project bag with the pattern and a second size of needles, if needed. I do have a few finished hats to share. First, the non-HFS hats. This one is a "Big Chunky Comfy Hat," a free pattern on Ravelry. The yarn is Sheep Shop Yarn Company Sheep 2 that I picked up years ago at Knit Knack in Arvada, Colorado. 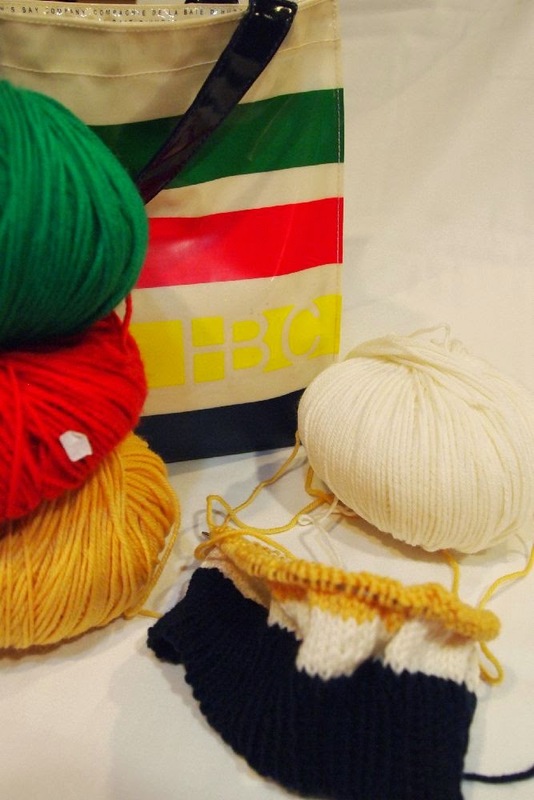 This is a super-speedy knit, perfect for a last-minute gift. 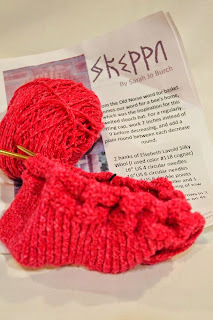 Next is the Skeppa hat, pattern by Sarah Jo Burch Designs and also available on Ravelry. 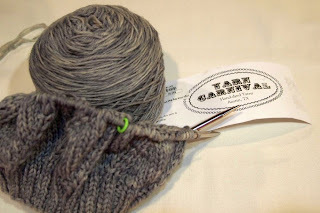 The yarn is Elsbeth Lavold's Silky Wool. 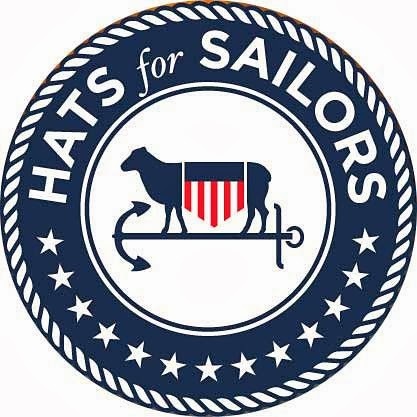 I'm up to 25 Hats for Sailors, almost halfway to my goal! 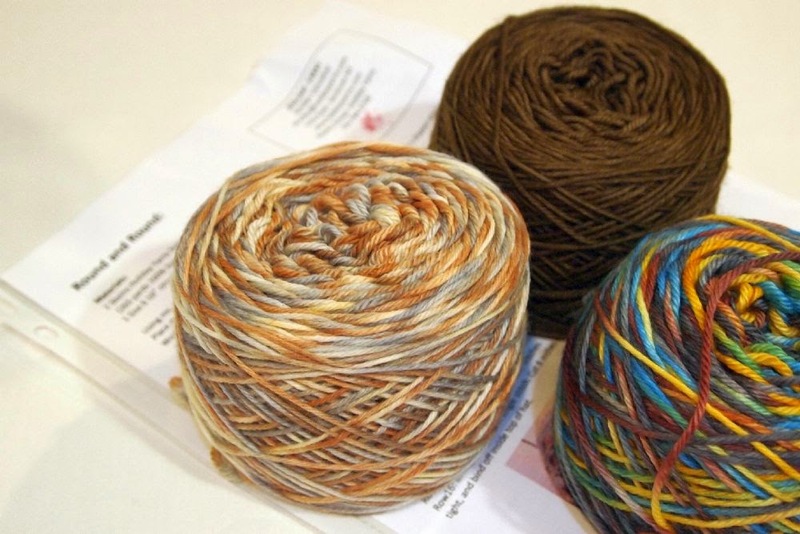 All three of these were made using the April HFS knit-along pattern, "Cobblestones" by Susie Gourlay. It's also free on Ravelry. 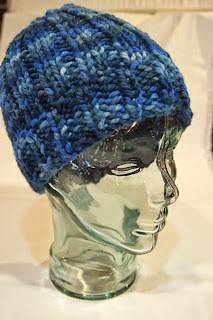 The yarn is Cascade 220 Superwash paints and Superwash solid. Now for the Works in Progress! HFS #26 is "Barley," from tincanknits. The yarn is ewe ewe Wooly Worsted, color Aquamarine, which I confess has given me fits. Ever have a yarn that just doesn't like you? This is the third or fourth project started with this yarn, prior attempts just haven't worked out. So far, the Barley hat is coming along fine! HFS #27 is made from a 100% wool sock yarn (thelabelismissing) and the Runner's Watchcap pattern from Chiagu. I'm 99.9% sure this is a machine-washable yarn, but if I can't find the label to be sure, it will go in the "someone will need a hat" bin. 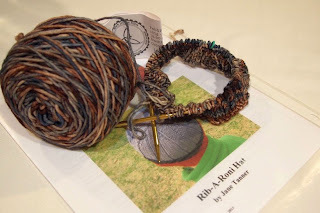 HFS #28 is the yet-to-be-cast-on Round and Round hat by Jennifer Vancalar. I searched and searched for Holiday Yarns, ordered it online, then found it all over in Texas! 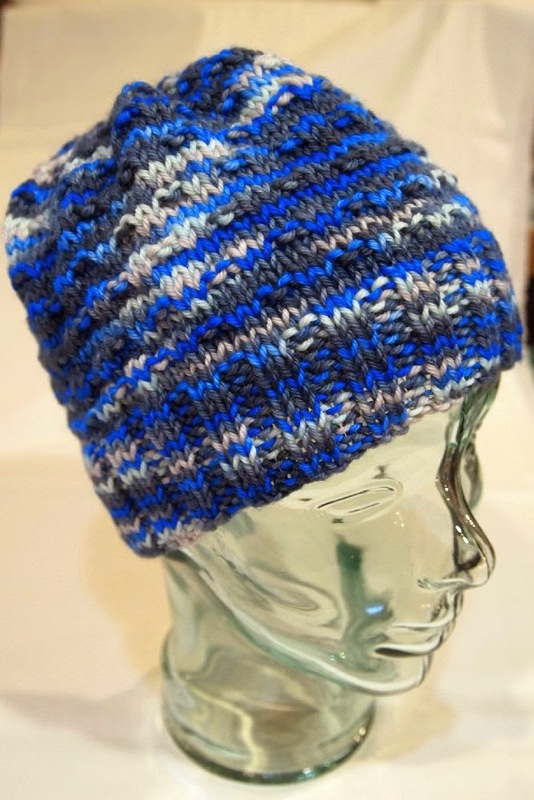 The pattern requires two colors, a solid and a space-dyed yarn. 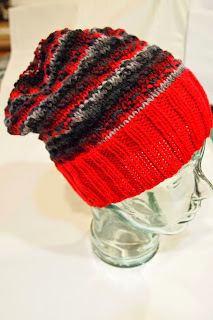 I have three skeins so I'll probably make two hats from this pattern. 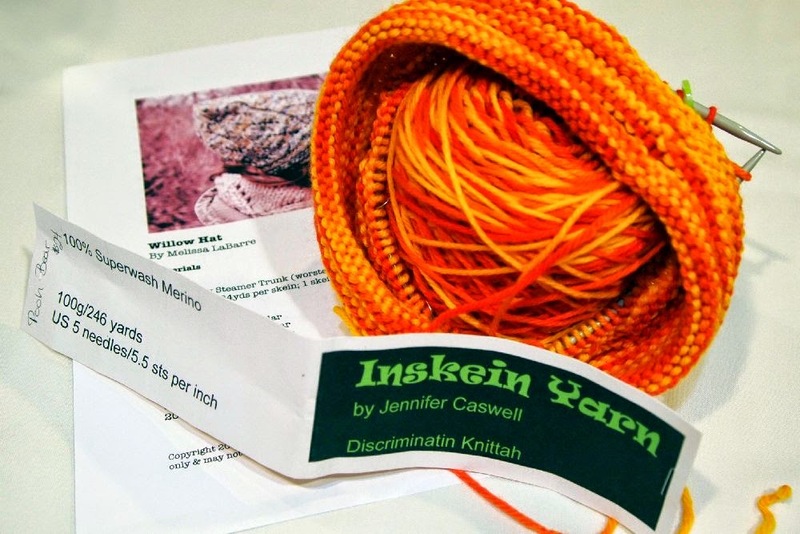 My "home" LYS in San Antonio is Inskein Yarns. Shannon and all the knitters at the Tuesday morning knitting group went out of their way to make me feel at home. 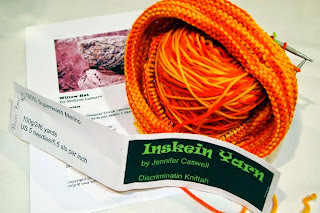 HFS #30 is being knit with a 100% superwash merino hand-dyed by Jennifer Caswell. The colorway is "Pooh Bear" and the pattern I'm using is "Willow Hat" by Melissa LeBarre (pattern on Ravelry). 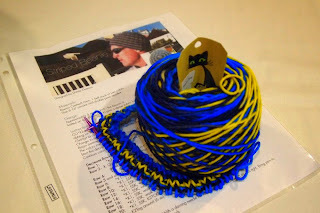 #31 is a yarn that's been in the stash for quite some time. The yarn is Gobelin from Biscotte & Cie, colorway Poisson Tang. 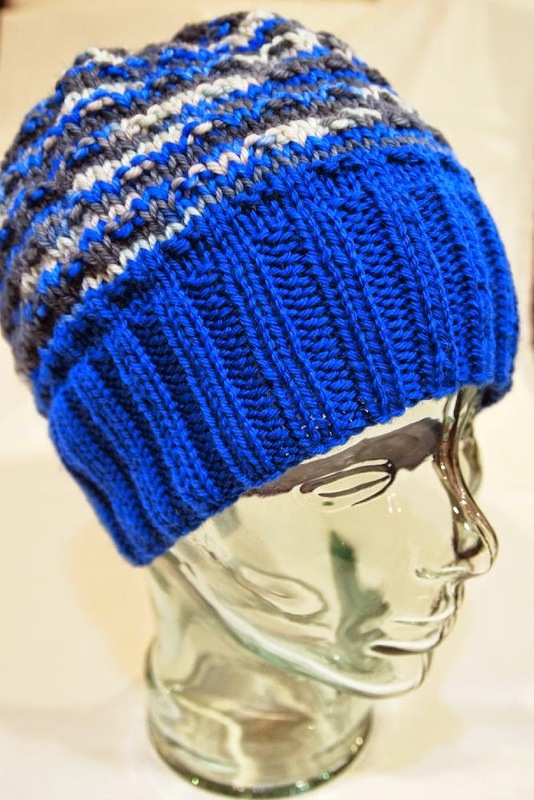 I'm using a favorite pattern, "Striped Beanie" by Donny Guercio (another free pattern on Ravelry). HFS #32 is another yarn from The Tinsmith's Wife. This is Pebble Worsted from Black Trillium Fibers, colorway "10th Doctor" (because who can resist David Tennant?) I using the Rib-A-Roni pattern by Jane Tanner (another freebie on Ravelry). 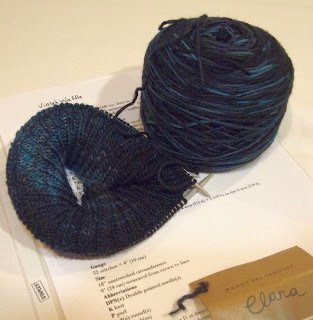 I can't remember where I bought this Manos del Uruguay yarn, "Clara," for HFS #33. The pattern is Violet Waffles by Halldora J, free (of course!) on Ravelry. This photo doesn't do justice to the gorgeous blue shades of the "Black Forest" colorway. Oh! 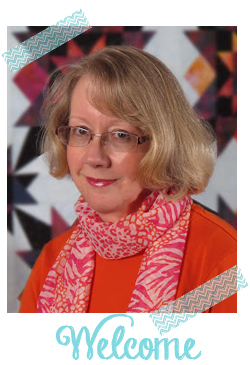 I bet I bought it at Table Rock Llamas, intending to knit the Black Forest Fire charity infinity scarf! Cast-on HFS #34 is my own creation, based on this Hudson's Bay Co. bag I bought in Victoria, BC 10 years ago. I'm using five colors of Cascade 220 Superwash to mimic the stripes of the iconic Hudson's Bay Blanket. That should keep me busy for a month or so! Wow. You are ploughing through these hats. I am still working on the same knitting project from the middle of last year: the blanket. I am looking forward to small things like hats soon. Almost there.